We're updating contact details for parents and emergency contacts. Please let the school office know if any of your phone numbers, email etc has changed. If you have a school tee shirt or track pants/jackets at home please return them to school for our sports teams etc to use. If parents are going to be late picking up children on any week day afternoon please phone the office by 2.30pm and let us know. Nau mai, piki mai - Welcome to our school. 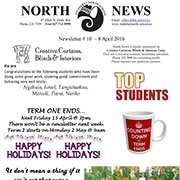 Titahi Bay North School (TBNS) is a small school with a committed staff, a number of whom are long serving with much knowledge about the local bay area and community. Staff work to provide learning experiences that develop student confidence and achievement. TBNS students are encouraged, and able, to display the attributes of being positive tuakana teina and role models. We also have a lot of fun as you can see...! An English medium (Auraki) strand – teaching learning areas from the New Zealand Curriculum. Teachers plan cooperatively to develop programmes to meet the needs of students. They share strengths and resources to support each other and the students. The school is involved in regular school wide events e.g. assembly, trips, singing, sports. Te Whānau o Te Kakano, a reo rumaki whanau began at TBNS over 30 years ago in response to community wishes and aspirations. We have 4 multilevel ruma auraki (English medium classes). The multi age groupings throughout the school allow for tuakana teina relationships, role modelling and learning to flourish. For the past 20 years we have catered for Year 7 and 8 students, which also adds to the special character of our school – a whanau whanui ‘country school in town’ feel. Children are with the same teacher and classmates for several years at TBNS. This creates strong relationships and kotahitanga. Research shows many benefits in having students learn in groups with older and younger peers and the pedagogical advantages of multi-age classrooms where students are with the same teacher for two or more years. The school's policies and procedures can be found at SchoolDocs. User name is TBN and password is policies. We're proud of our efforts and achievements in curriculum and in activities such as kapa haka, sports participation, the arts and Education Outside of the Classroom activities. Most years we have a number of our senior students from our Māori Medium class sitting NCEA Level One Māori. We welcome whanau participation in school life. The best conditions for learning are created when whanau take an active interest in their child's school activities and learning. Check out the activities and happenings at TBNS on the facebook link below.